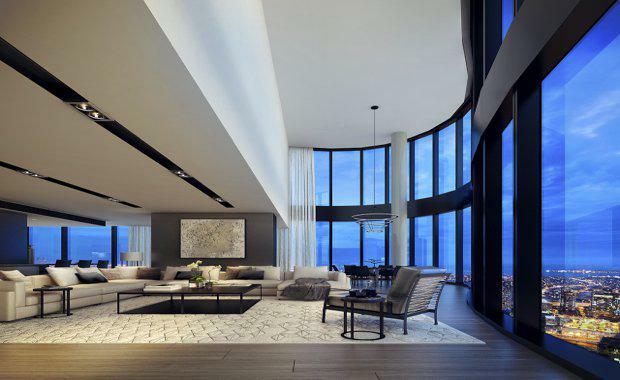 A Chinese businessman has purchased a Melbourne penthouse for $25 million, breaking the record for the most expensive apartment ever sold in Australia. The 750sqm penthouse is located 319m above street level in the tallest residence in the Southern Hemisphere, the Australia 108 tower. The sale was negotiated between CBRE Residential Projects and Tim Kennan, owner of KM Sales and Marketing, on behalf of the project’s developer World Class Land. It has raised the bar for price per square metre in Melbourne, with the apartment costing more than $33,000 per square metre. The purchaser will use the penthouse as his private residence when in Melbourne each year. The landmark property, which went on sale on February 14, will offer 360 degree views of Melbourne and will span the entire top floor of Australia 108. It will feature its own grand entrance foyer on level 98 as well as a private glass elevator and exclusive use of the building’s world-first Star Club recreation facilities. CBRE Residential Projects managing director Andrew Leoncelli said more than 90 per cent of Australia 108’s 1105 apartments had been sold, with buyers locally and internationally flocking to snap up a slice of the iconic development. “More than 1000 apartments have been sold – this represents the largest number of apartments ever sold in a single building in Australia,” he said. “The extraordinary sale of the Australia 108 penthouse sets a new benchmark for pricing, breaking all records ever set in Australia. It is by far the most opulent, landmark and exciting trophy apartment ever brought to market. Mr Leoncelli said while property fans worldwide had enquired about the landmark project, many apartments had sold to Melburnians. “We have had strong interest from local owner occupiers in particular, with some of the statement cloud-breaking apartments selling to local business leaders who want to live in this landmark building,” he said. Designed by architects Fender Katsalidis, Australia 108 is divided into two types of apartments – 161 Cloud Residences above the Star Club and 944 apartments below. Just 25 per cent of Cloud Residences remain for sale, less than two months following the development’s official launch in Australia. “Interest is still high, with buyers recognising there are now limited opportunities to own a piece of this iconic building. We still have some sub-penthouses left for sale and anticipate interest in these will heighten following the penthouse sale,” Mr Leoncelli said. Construction of Australia 108 has commenced, with demolition commencing at the project’s Southbank site. The building will be constructed over three phases, with final completion in 2019. Australia 108 represents Singapore-based World Class Land’s first entry into the Australian market and will followed up by a second Melbourne residential tower planned to launch at A’ Beckett Street later this year.